Many high school graduates would jump at the chance to be a full-time musician instead of going to college. Indeed, teen singers like Leann Rimes, Taylor Swift, and others declined going to college right after high school in order to focus on their careers. 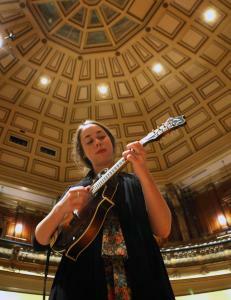 With a debut album already released, a performance slot on "Prarie Home Companion," and performances with many bluegrass greats under her belt, Sarah Jarosz chose instead to enroll in the New England Conservatory of Music. "I talked to a lot of musicians that I respect and got a lot of different opinions," Jarosz tells The Boston Globe. "And I definitely did ponder the idea of just going straight into the music career. But there's always more to learn, and I also didn't want to miss out on the college experience. My roommate is a classical vocal performance major; she does a lot of opera singing, which is something I've never really been around before. I've been listening to a ton of Billie Holiday and Sarah Vaughan. I'm in a world music and a Jewish music ensemble. I'm getting out of my comfort zone." Bluegrass legend Jerry Douglas, who recorded on Sarah's debut album, isn't worried that her decision might tank her career. "She can see the future," Douglas says, "because she has one."